The goal of this tutorial is to show you how to implement drag and drop between RadTreeView and ListBox. For the purpose of this example, you will need to create an empty application project and open it in Visual Studio. Then you can define the controls in your view. As the purpose of this tutorial is to demonstrate how to implement drag and drop operations, we won't focus on the definitions of the controls in xaml. However, please note to set the RadTreeView IsDragDropEnabled property to true. <TextBlock Margin="2 0 0 0"
The next step is to use the DragDropManager to enable the drop operation on the ListBox control. Find the ListBox declaration and set its AllowDrop property to True. telerik is alias for the following namespace declaration: xmlns:telerik="http://schemas.telerik.com/2008/xaml/presentation"
Next we'll need to populate the controls with data but as the ViewModels definitions are outside the scope of this tutorial, we'll omit them for clarity. 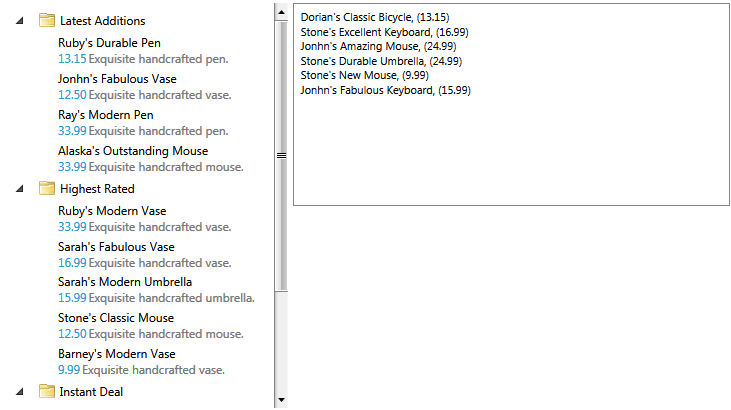 We'll only assume that the RadTreeView is populated with categories and each category displays a list of products. 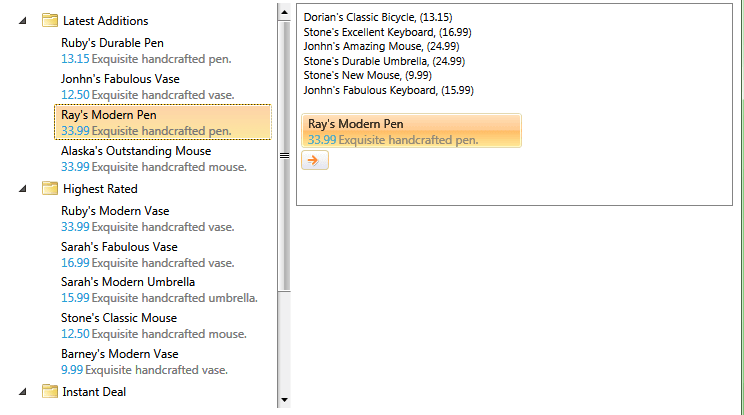 While, the ListBox displays a collection of products. This means that we'll have to implement a logic that allows you to drag a product from the ListBox and drop it inside a category in the tree. Please have in mind that if the ItemsSource of the RadTreeView (RadTreeViewItem) is not an IList, then the drop operation won't be allowed. Moreover, we recommend using a collection that implements the INotifyCollectionChanged interface, for instance an ObservableCollection, as only then the changes implemented in the RadTreeView underlying data collection will be reflected in the UI of the control. Now we're getting to the actual DragDrop implementation. And we'll start with configuring the ListBox as a participant in drag and drop operations. Please note that this article is based on the TreeToGrid online demo. You can find more information about the DragDropManager events in this tutorial. methods that attach and detach the DragDropManager event handlers. Now let's attach handlers for the DragDropManager events listed above. We'll do that in the SubscribeToDragDropEvents() method and we'll detach from these handlers in the implementation of the UnsubscribeFromDragDropEvents() method. Then we can implement the GiveFeedback event handler, which is quite straight-forward. As this event enables the drop source to give feedback information to the user, we'll use it to change the appearance of the mouse pointer to indicate the effects allowed by the drop target. Next, we have to handle the DragOver event and implement a logic that decides if the current drag operation is supported over the current drop destination. In this example, we won't allow a drag operation within the ListBox, which means that we have to make sure that the drag operation is allowed only if it originates from the RadTreeView control. RadTreeView drag operation creates an object of type TreeViewDragDropOptions that holds all information related to the drag. 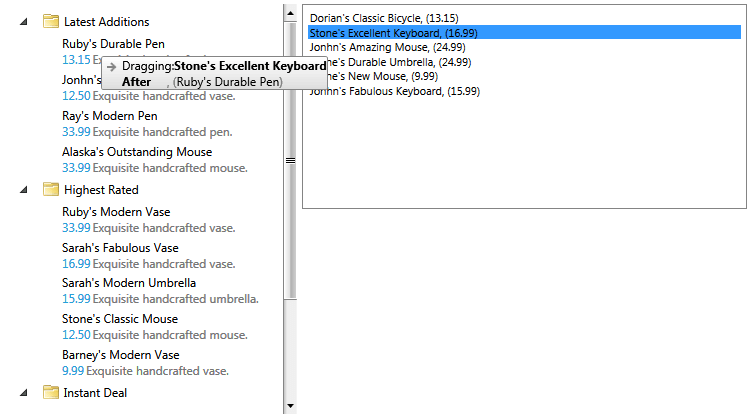 You can read more about the properties exposed by the type in the Drag and Drop article. Finally we'll have to implement the actual drop logic and we'll also have to update the collection displayed in the source of the drag operation accordingly. We'll do that in the handlers of the Drop and DragDropCompleted events. With this the ListBox drag/drop logic is complete. All we have finalize now, is the definition of the control to enable the ListBoxDragDropBehavior. So please find the declaration of the ListBox and add the following line: 'example:ListBoxDragDropBehavior.IsEnabled="True"', where example is an alias pointing to the namespace in which we've defined the ListBoxDragDropBehavior class. If you run the solution now, you should be able to drag items from the RadTreeView and drop them in the ListBox. And if you start dragging an item from the ListBox, you'll be able to get the item's data and even display an informative tooltip describing the dragged item. However, this tooltip won't be updated while dragging over the RadTreeView and you won't be able to drop the item among the tree items. This is due to the fact that the RadTreeView built-in drag/drop logic is implemented to handle only drag originating from a RadTreeView. Therefore, you will also have to set up the tree to process a drag coming from a ListBox. In order to configure the RadTreeView to process the drop of an item coming from another control, you need to attach a handler for the DragDropManager Drop event. And to make the dragging operation more informative, we can also subscribe to the DragDropManager DragOver event to update the drag operation information tooltip while dragging over the RadTreeView. If you take a closer look at the above code snippet, you'll notice that it basically tracks the current drop destination and position. Then based on its type and value, the code decides if the drag operation is allowed, updating the visual representation of the operation at the same time. With that last piece of code, our application is ready. It can now provide a fluent drag-drop operation between a RadTreeView and a ListBox control. You can download a runnable project of the demonstrated example from our online SDK repository here, after navigating to TreeView/DragDropTreeViewToControls.